The very first Pro-Drive was designed with reverse in mind. Knowing the problems with using the conventional outboard reverse in swamp conditions, a different approach was taken. Rotating the motor and lower unit 180 degrees like the old small outboard motors seemed to be the simplest, most effective, and most trouble-free method. However, fuel and battery connections, controls, and a hot muffler seemed to disagree. So it was decided that the lower unit would have to rotate 180 degrees while the powerhead and controls remained with the operator. At the same time the drive shaft and the lower unit drive shaft would have to remain together and perfectly in line. We realized that most situations boats get stuck in are when forward power has no more effect due to the boat being on top of heavy vegetation or ground, or there is no way to turn around. Propellers are designed and tested again and again to get the most power and speed out of a boat and motor, going forward, not backing up. What happens in reverse? The propeller is rotated backwards and some reverse thrust is achieved, but only a small percent of when the motor is in forward. What happens when a backwards rotating propeller contacts an obstruction? The trailing edge strikes first and “hooks” the obstruction, often bringing the motor to a complete stop. On surface driven mudmotors, due to prop design, reversing the propeller is even more ineffective than conventional outboard props. When a Pro-Drive is in reverse the skeg is in front protecting the propeller just as it is when in forward. The propeller is still rotating the same direction, the way a propeller is designed to work, giving the real power that the motor is capable of, while the “round leading edge” glances off of obstructions. Water is forced under the boat, between the bottom and whatever the boat is stuck on. The rear of the boat is lifted. 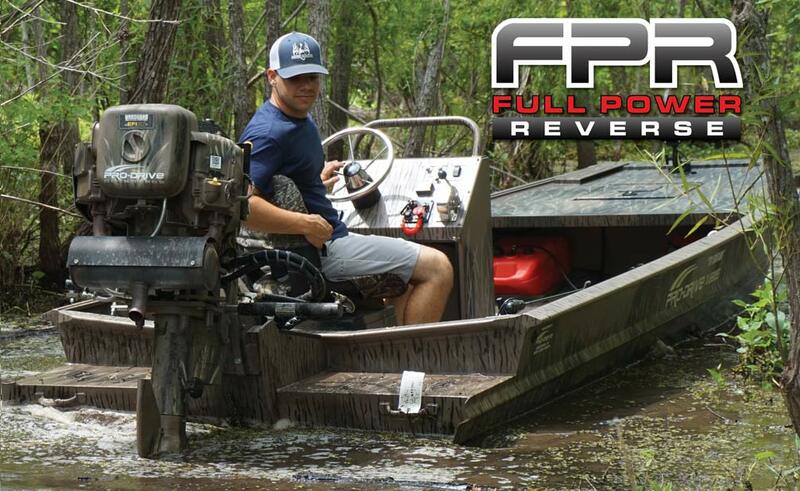 The capabilities of Pro-Drive’s full-power reverse can only be realized in the many swamp and marsh situations that without it, a shallow water outboard becomes immobilized. Take a ride in a Pro-Drive with full-power reverse and find out. Full power reverse and full power control of the boat while in reverse. The team at Pro-Drive believes that reverse on a mud motor has to be able to perform where mud motors live, in the mud, stumps, logs and vegetation. They set out to design a reverse worthy of the Pro-Drive name and ended up producing a system that performs beyond their greatest expectations. The New Pro-Drive Reverse System can be retrofitted to any existing Pro-Drive Shallow Water Outboard with a simple conversion kit. Kits will be available for direct customer installation or units can be converted at any authorized Pro-Drive Dealer.